ABUJA, Nigeria - The Islamist militant group Boko Haram has threatened to sell hundreds of Nigerian schoolgirls abducted during a raid last month, the French news agency AFP reported on Monday. AFP said it had obtained a video from Boko Haram showing the group's leader Abubakar Shekau claiming responsibility for the kidnappings by saying "I abducted your girls." "I will sell them in the market," Shekau adds, according to AFP. It did not immediately give further details and the report could not immediately be verified by NBC News. The girls were seized from a secondary school in the village of Chibok in northeast Nigeria on April 14. The kidnappings have sparked numerous protests throughout Nigeria outraged over perceived government inaction and ineptitude. Demonstrations have spread to Washington and London, with pressure mounting over the Nigerian government's failure to find the girls. 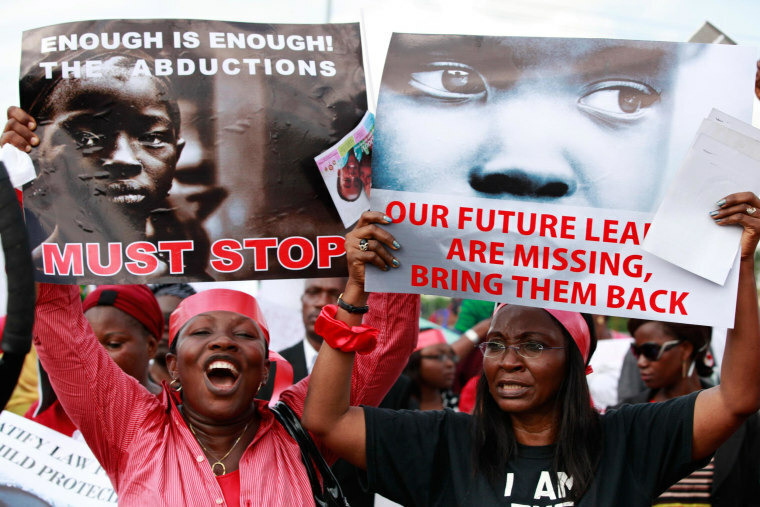 Nigeria’s president over the weekend insisted the girls would be found. Last week, the U.S. said it was working with Nigeria to support their efforts to find the girls amid reports the schoolgirls are being sold into marriage. Boko Haram - whose name means "Western education is sinful" has been waging an increasingly violent campaign to carve out an Islamic state in northern Nigeria. While much of the group’s five-year insurgency has targeted the northeast, recent attacks blamed on Boko Haram – such as the bombing last month of a crowded bus station in Abuja – indicate the group could be extending its reach. The U.S. State Department ranks Boko Haram as one of the most dangerous terror groups in the world, alongside the Taliban in Afghanistan and al Qaeda factions in Iraq and the Arabian Peninsula.